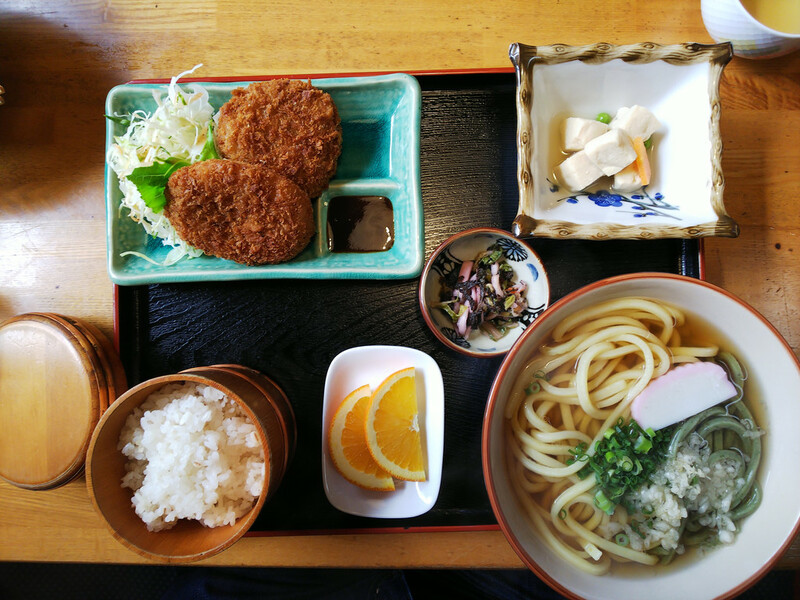 Today, I’m going to tell you about what is my favorite udon restaurant in Takamatsu and just one of my favorite restaurants in town overall. It’s called Oshima-ya and their specialty is wakame udon! And by wakame udon, I do not mean regular udon with some wakame in the soup. Here, the udon is made with wakame included in the dough. The result is a green noodle and its delicious. Not only that, but quite regularly, the chef makes some seasonal udon with various regional products. So on top of wakame udon, you may eat buckwheat udon, sesame udon, but also anchovy udon, and even fruity udon like strawberry udon or cherry udon. 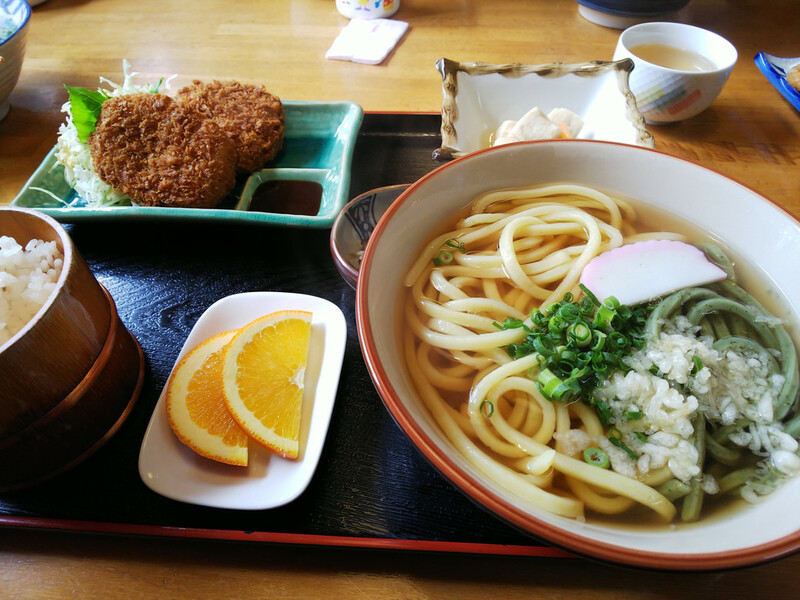 I went this week-end when I took the picture, and yuzu udon was served alongside the wakame udon. Now, the thought of eating such strange udon may sound unappealing, but don’t be mistaken, while the udon can be quite colorful, the taste is always very subtle and it will always mostly taste like udon, except that it’ll have a discreet secondary flavor that will never take over the main one. You’ll have your bowl of kake udon (read “kahkeh” not “cake” 😉 ), a smaller bowl of rice, one small plate of pickled vegetables and another one with a salad, and you’ll have the special of the day. Here, it was meat and potato koroke (croquettes), it can also be tempura, small grilled fish and more. Finally, a few slices of fruit as dessert. Everything is seasonal, and everything is local even the rice (Kagawa doesn’t produce a lot of rice, so you don’t often find local rice in restaurants). Do you want to know what my favorite part is? It’s the broth that comes with the udon. As you may already know, such a broth is called dashi, it’s one of the bases of Japanese cuisine, and a good broth for udon is usually made from iriko (a small fish similar to sardines or anchovies) usually from Ibukijima. Oshima-ya has some of the best broths I have ever eaten (drunk). There’s usually not a drop left in my bowl after finishing my lunch. Finally, the “cherry on the cake”, the thing that makes this place amazing beyond the food are the owners themselves. 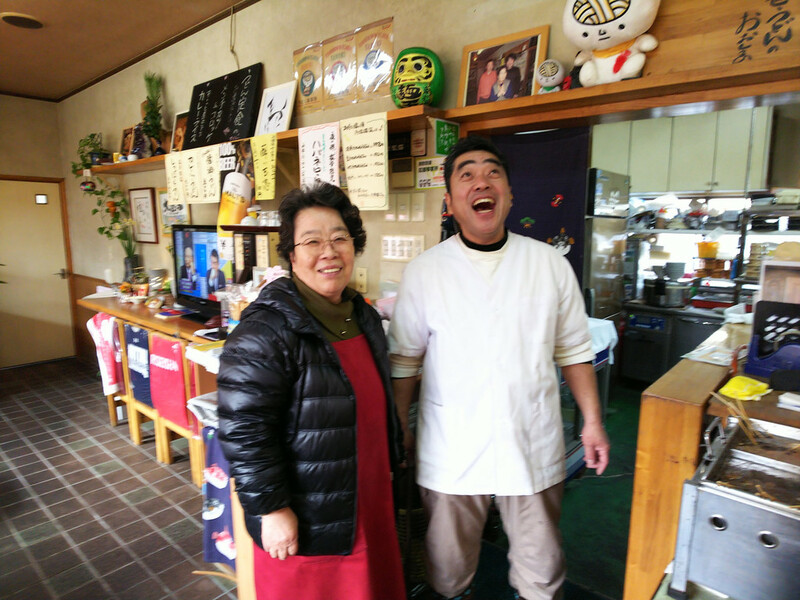 In a region full of welcoming and friendly people, the Oshimas (that’s Mr. Oshima, his wife – not pictured – and his mother) are some of the friendliest and most welcoming ones. They always really make you feel at home, always take some time to chat with you if the restaurant is not too busy (and even if it is, they still do it, just more briefly). Sure you’re in a restaurant and you’re a customer, but they really make you feel like you’re their guests. It’s always always a pleasure to go there, and not just for the food, despite it being amazing. 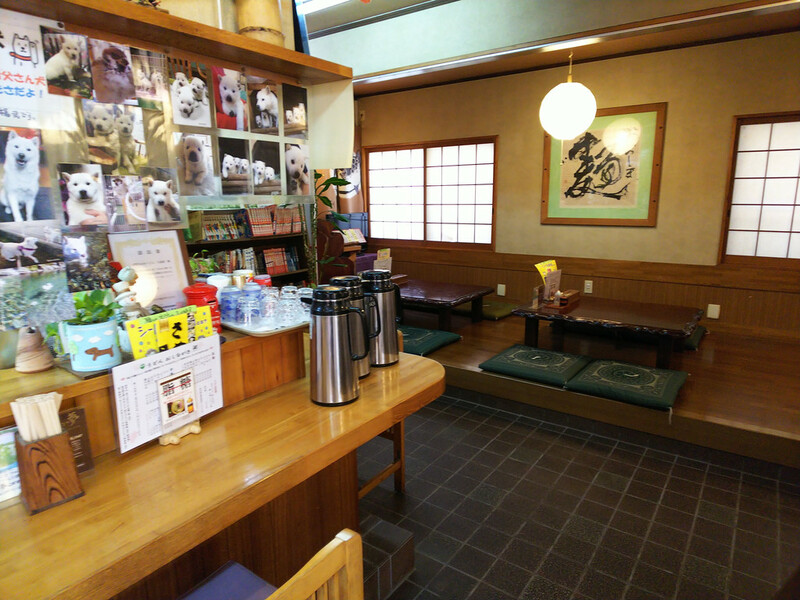 They also have a blog where they talk about udon, their customers, and a few other things.